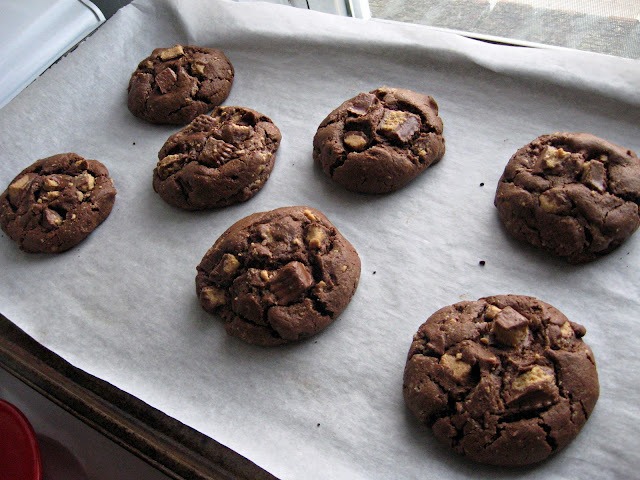 In a medium bowl combine flour, cocoa powder, baking soda, and salt. In a large bowl beat peanut butter, butter, and sugars on medium speed until "fluffy". Blend in egg, vanilla, and milk until smooth. On low speed (with hand or stand mixer) mix dry ingredients in with the rest until just incorporated. Add 1 1/2 cups chopped peanut butter cups and fold in gently with a spatula. Using a large scoop (3 tbsp.) place rounds of dough on parchment/silpat lined baking sheets, 2-3 in. apart. Press a few pieces of the reserved peanut butter cups into top of each dough ball. Bake 12-14 minutes, rotating pans halfway through baking time. Linking up here, here, here and here. Oh, I am with you on the cookie obsession! They are hands down my most favorite sweet treat. 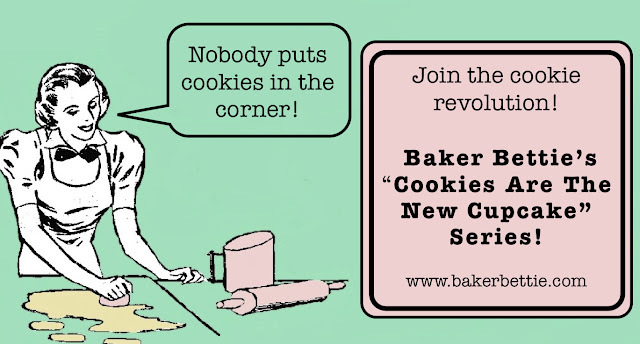 I am going to have check out Baker Bettie now! And these cookies are awesome...nothing better than a PB chocolate combo! Yum! I love the great big chunks of peanut butter cups. I am definitely a cookie girl. Reese's does make everything better and these cookies look very addictive. Some classic combos never go out of style-yum! 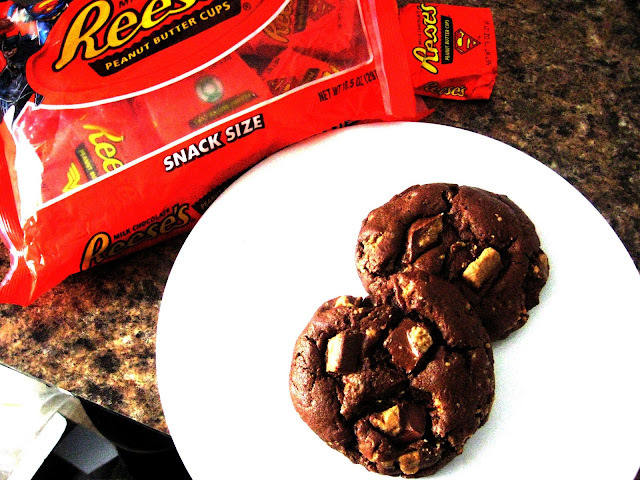 Perfect for the cookie jar. Have a great day! Haha seriously long live the cookie! 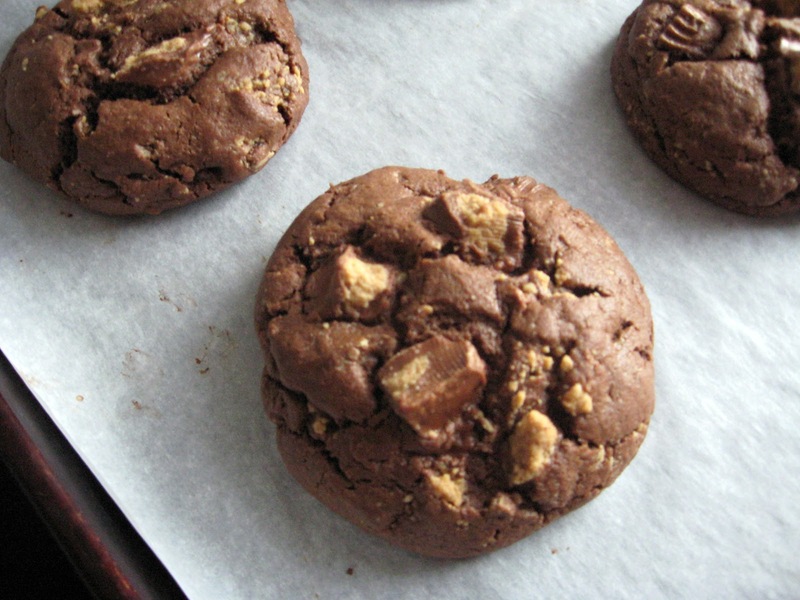 Especially peanut butter chocolate cookies, my last meal would definitely include some of those :) I am obsessed with the recipe, I might have to give them a try today! Funny one of my blog posts in the queue coming soon, I refer to myself as a cookie monster too :-) From one cookie monster to another...yum! Thanks so much for sharing at Scrumptious Sunday at Addicted to Recipes! Hope to see you at the next link party, starting Sunday!